The largest release to date of Tempo’s flagship product, Tempo Timesheets, provides better insights into business cost centers and revenue sources centrally within Atlassian’s popular JIRA product. With more than 7,000 Tempo Timesheets customers and a variety of teams using JIRA, we are providing businesses with better visibility over all of their work initiatives and cost centers, enabling better teamwork and smarter decision making. 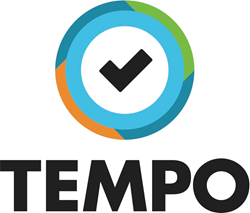 Tempo, a global leader and developer of time-tracking, resource planning, and financial management software add-ons for Atlassian’s project management products, JIRA Software, JIRA Service Desk, and JIRA Core, today released the 8.0 version of the award-winning Tempo Timesheets solution to the Atlassian Marketplace, its largest release to date. The extended Tempo Timesheets product better enables businesses and teams, including those working in Agile, to manage time spent for accounting, payroll, billing, and accurate forecasting through one single, purpose-built solution. Wrapped in a simplified, intuitive user interface, Tempo Timesheets helps software, IT, services, and business teams plan, track, and report on time spent on JIRA projects and tasks, including for customer projects and accounts. The Tempo Timesheets release ships with new features and enhancements to popular features, such as expense, revenue, and team utilization reporting. Tempo Timesheets integrates with other Tempo products, including Tempo Planner for high-level and granular planning and resource management, and Tempo Folio, for project and portfolio financial management. Time and Expenses Report: Get detailed overviews of revenue and price rates associated with work performed, capturing expenses associated with project tasks in JIRA for accounting and customer billing. Team Utilization Report: Gain insights into how teams are spending their time on projects and tasks to calculate costs and measure business value. Revenue Report: Track revenue and project performance directly in JIRA. Set revenue targets and monitor progress in real-time, including expenses logged by team members. Custom Price Rates: Define price rates based on team roles and expertise. Custom price tables provide flexibility to model pricing based on contracts, including client or account discounts. Unaccounted for Hours: Ensure that all employee work time spent in JIRA adds up for accurate accounting and billing. Office 365 Calendar Integration: In addition to Google Calendar integration, Tempo’s free mobile app now enables users to quickly convert Office 365 Calendar events into registered worklogs in JIRA. Annual Tempo Timesheets 8.0 licenses are available for server versions of JIRA, starting at $10 per year for 10 users, and can be purchased through the Atlassian Marketplace. Tempo Timesheets offers enterprise and JIRA Data Center support, with upgradeable license tiers serving more than JIRA 10,000 users. Free 30-day Tempo evaluations are available for server and cloud through the Atlassian Marketplace. Over the upcoming months, Tempo will launch a next generation of cloud products for Atlassian’s JIRA Connect technology to provide new growth opportunities for mobile and other Atlassian cloud products, including a new breed of Tempo features and solutions. Tempo is a leading provider of sophisticated software solutions for Atlassian JIRA that help boost the productivity of technical and non-technical teams, offering seamless integration, flexibility, and real-time visibility into work initiatives for strategic alignment and decision making. More than 8,600 customers from a wide range of industries worldwide, ranging from small startups to large-scale enterprises including Amazon, BMW, Pfizer, HomeAway, PayPal, Hulu, Dell, and Disney trust Tempo to collaborate, plan, budget, track and work smarter. To learn more about Tempo, visit http://www.tempo.io.